A very easy in-and-out hike from a boardwalk to the salt flats of Badwater Basin, the lowest point of elevation in the Western Hemisphere. Even though it’s not a very challenging hike, if you’re in Death Valley National Park, this is pretty much a must-see. Let’s face it – if you’re taking a trip to Death Valley, you’re going there for the superlatives – it’s the lowest, driest, hottest place in North America, and depending on how you word those superlatives, it could also rank among the world’s hottest places, too. So chances are if you’re making a trip to Death Valley National Park, you’re going to want to try to visit the lowest point of elevation in the Western Hemisphere – Badwater Basin. Since it is one of the primary tourist destinations in the park, Badwater is very well signed and hard to miss – there’s a large parking area that usually has a healthy amount of cars in it. If that fails, just look for the spot in the middle of the salt flats where you see people wandering about aimlessly. Depending on the rainfall that year, this lake-let can expand or shrink in size. 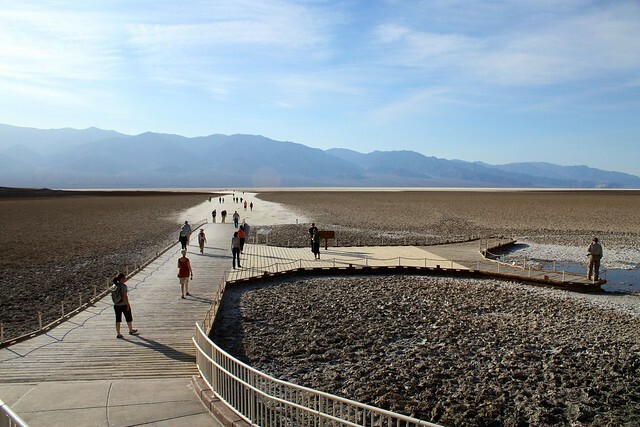 During the winter of 2004-5, Death Valley received four-times its average rainfall, and a temporary body of water called Lake Badwater formed here, at the location of the prehistoric inland sea known as Lake Manly. 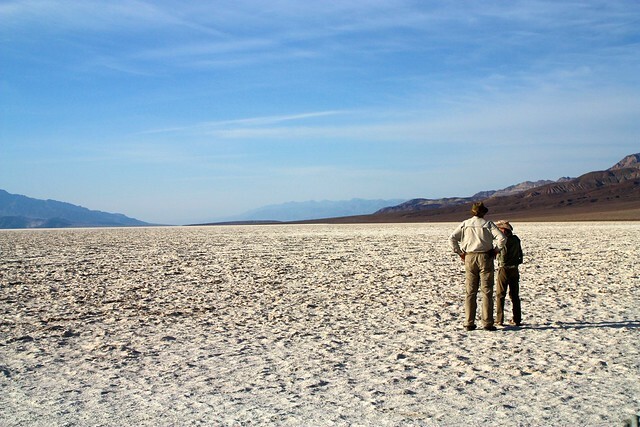 For most visitors, though, you’ll just walk off the boardwalk and onto the salt flats themselves. The effect is – in a way that is oddly commonplace in Death Valley – otherworldly. You are walking on a completely desolate carpet of table salt on a nearly perfectly flat valley surrounded by enormous mountains (the tallest peak in the Lower 48 – Mount Whitney – is only 85 miles away and 11,043 foot Telescope Peak is visible to the west). There really isn’t anything like it on the planet. The actual lowest point in the Western Hemisphere is out in the salt flats a ways, but it’s not noted by a USGS marker or plaque so you’ll have to rely on a GPS … or just noting where the footprints in the salt start petering out. Stay out in the flats as long as you like. Enjoy the relative silence and isolation, as well as the strange and unique landscape around you – and marvel at the early settlers who had to live and work in a place like this. Nonexistant - you're basically just walking on the bed of an ancient ocean. There are several campgrounds in Death Valley. From the junction between CA-190 and CA-178 (Badwater Road) near the Furnace Creek Inn, head south for 16.7 miles. The parking area will be clearly visible on the west side of the road. If you are heading into the park from the Southern Entrance, Badwater is 47 miles inside the park. I did two trips to Badwater this year. One was in April. 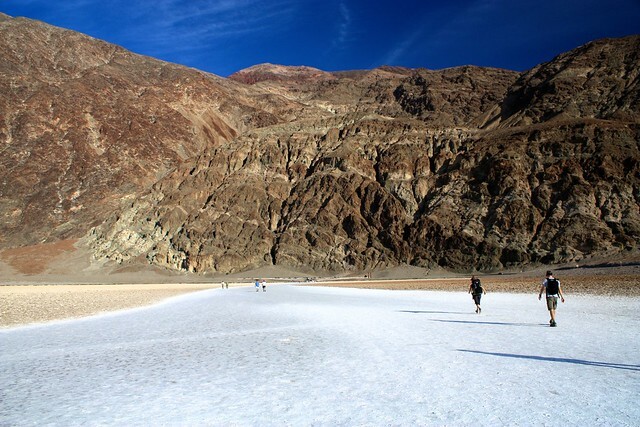 I walked through the middle of the Valley from Furnace Creek to Badwater. Temperatures got into the mid to upper 90's officially, a bit hotter on the flats. I ended up traveling 25(+) miles, though it is just about 18 miles. Out in the middle of the Devil's Golf Course, it is like a maze when trying to avoid the really big or deep salt formations. The walk took about 9.5 hours. The purpose was to test a pair of boots for 5.11 Tactical. I returned in July for the 100th anniversary of Death Valley's record temp. I and two coworkers walked for 1 hour due west from Badwater, carrying an ample supply of water, electrolytes and ice packs. Once we reached the one hour mark, we stopped and sat for one hour before returning. It was surreal, silent (except for the stifling breeze), and almost scary. 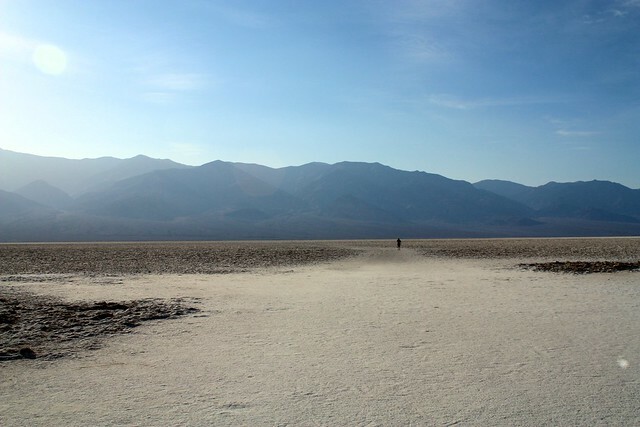 The middle of Death Valley in the middle of the summer is like nothing else on Earth. This is a wonderful place to hike, though dangerous if one is ill equipped. For the adventurous, it is well worth the drive. Thanks for the heads up - every once in a while, a mistake sneaks through - I'll fix it ASAP! I think your link to the trailhead may be incorrect. When I clicked on it, I was shown the following coordinates on Google Maps: 34.287113,-117.843261. According to Google Maps, this is the San Gabriel Canyon Rd. in the LA National Forest. I started to type in my address to look up driving directions to this location. But then I vaguely remember that Death Valley should be farther north, right? By the way, I love this website. I am so grateful for the detailed trail writeups, the photos, and (most importantly) tips on where to park when you get there! This is a great review I had no idea that it got 4 times the normal rain and actually created a small lake, that would have been interesting to see! I recently went out this area and reviewed it on my blog as well. I remember when my fried Harry Johnson and I went there years ago, it was like an oven! I can't imagine hiking in that heat! For me, I would drive up to the, what looked like honey combs (kilns), where they used to make their own charcoal high up above. There is a hiking trail there and it is much cooler. Its a little bit of a drive, but its worth it just to be cool!